Taste test: There's only one major problem with most no-salt potato chips, and the problem is that they have almost no taste to them. Unless you have have some salt to sprinkle on the chips, or something to dip them in, they just don't make a very good snack. 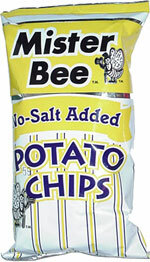 These are no exception: When you eat your first chip, there's just no taste at all. If you have a several chips in rapid succession, you do get some potato taste. It's still not a lot, but it's OK. 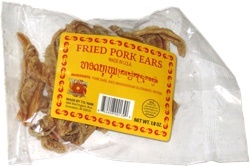 So our recommentation is that you definitely should not eat just one. Smell test: Potatoey, kind of greasy.